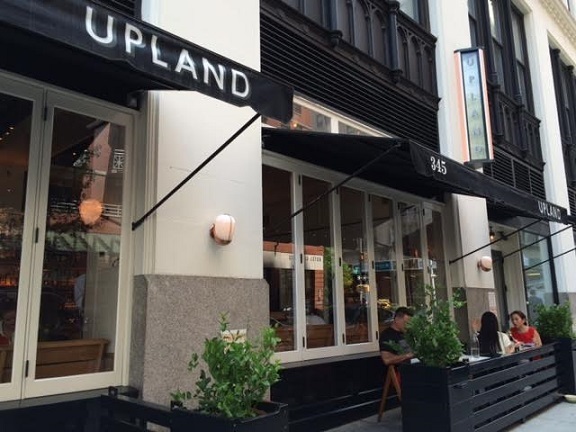 Upland, 345 Park Ave. South (at 26th), New York City; open daily for lunch and dinner, with brunch on Sundays. This will be a little different: a Restaurant of the Week post about a different part of the country. But under the circumstances, it works, as Inland Valley types are flocking to NYC’s Upland. Heck, more locals may find this post of practical value than some of my writeups on obscure noodle shops in Chino Hills. Rather than create a “Restaurants: New York City” or “Restaurants: Anywhere But Here” category, I’ve simply slotted this in “Restaurants: Upland.” If it’s in the name, it counts, right? First off, Upland is the subject of my June 24 column, which can be read here. 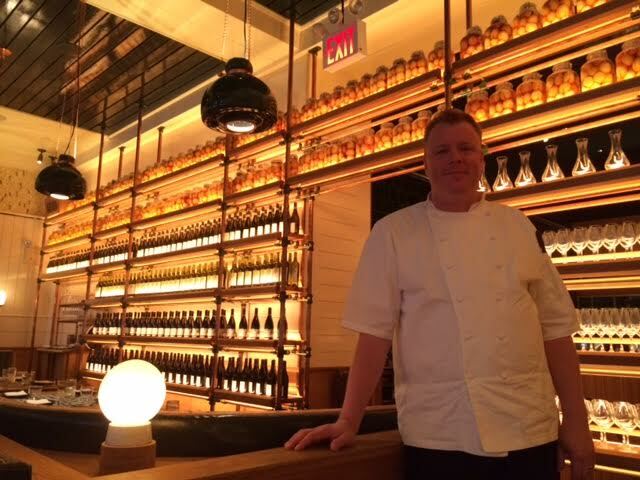 In brief, Upland is the brainchild of an Upland-born chef, Justin Smillie, who makes his living in Manhattan. It opened in October 2014 after weeks of anticipation and has received a warm welcome from customers and many reviewers. I read about it in the New Yorker, a national publication. I got in for lunch with a couple of days’ notice during my recent New York vacation. I met my friend Lesley from Queens, who is originally from Rancho Cucamonga. There are a lot of Inland Valley expatriates. For us locals, there’s a weird thrill to walking up to the restaurant, which is on 26th no matter what the address says, and finding the name “Upland” on the awnings and vertical sign. Good spot for a Daily Bulletin on Vacation photo. 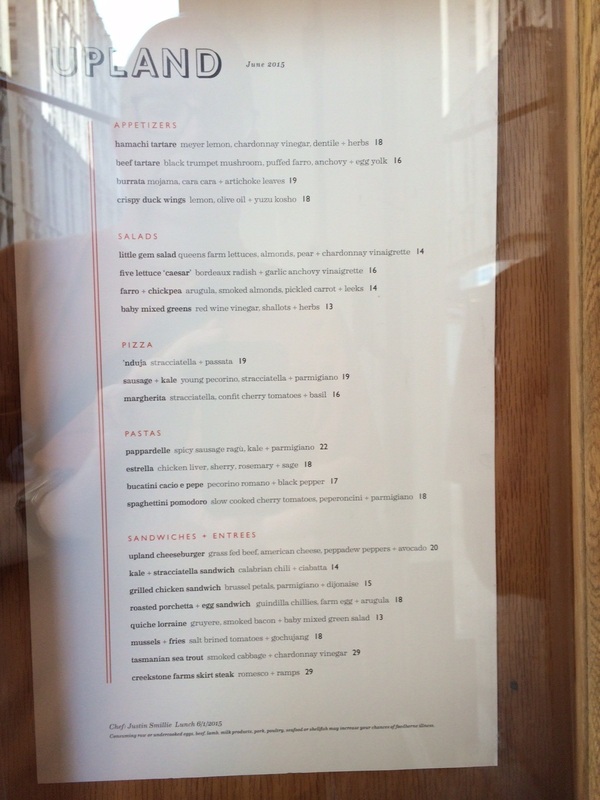 The menu at Upland changes monthly. Here’s what is being served in June for lunch. 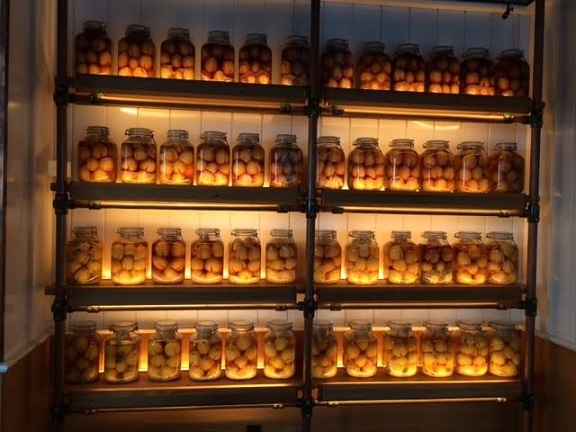 The entryway has jars of lemons, a nod to the real Upland. It was the tail end of the lunch hour when we arrived. 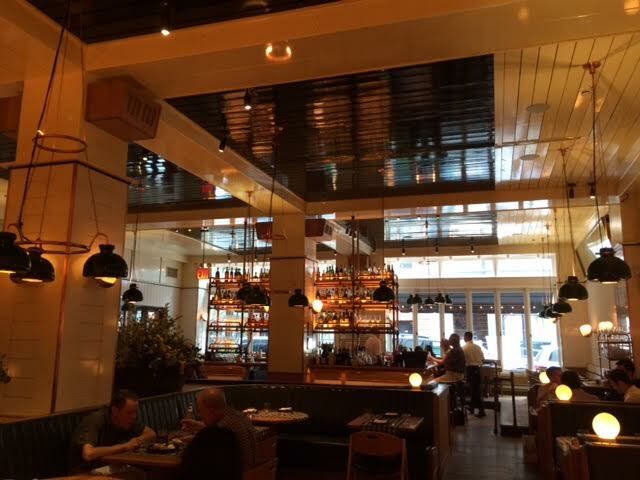 The dining room has a lot of copper, green and oak, with a high ceiling, very pleasant, as well as a bar with four sides of seating, apparently popular with the after-work crowd. We ordered hamachi tartare ($18) as an appetizer and two entrees: mussels ($18) and sausage and kale pizza ($19), plus for dessert, a rhubarb and almond tart ($10). 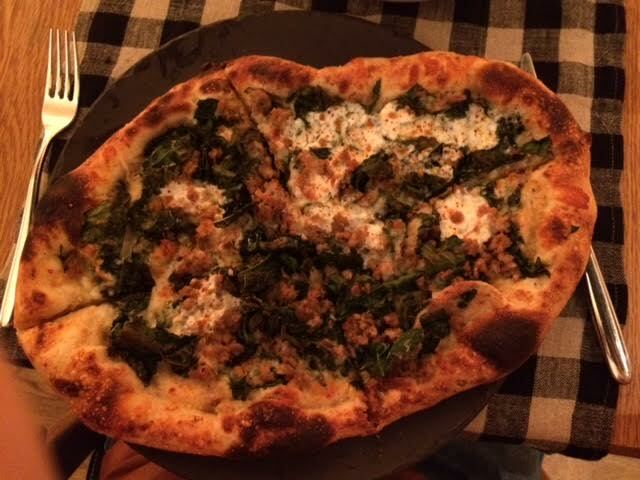 The cooking has been described as California-Italian, with a lot of seasonal dishes and ingredients plus excellent pastas and pizzas, which are more Neapolitan than New York. 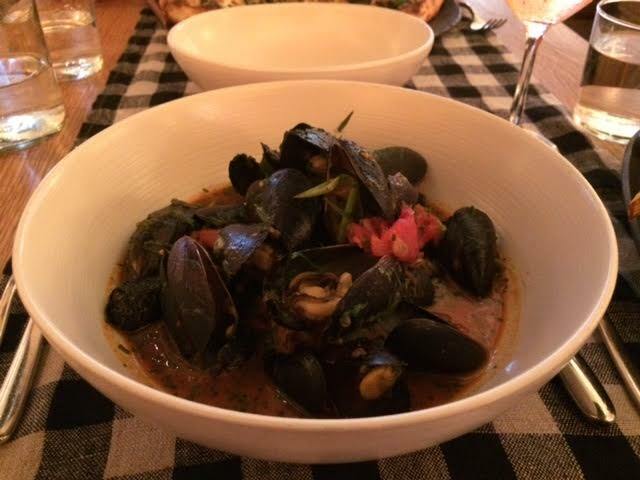 We were very satisfied with our meal, and the service was cheerful and chatty. Near the end, I had to identify myself because I had an appointment with Smillie, a communication that, as I feared, resulted in having the meal comped. Oh well, it was vacation. As in the previous time or two that’s happened at restaurants, I’m disclosing that fact here. 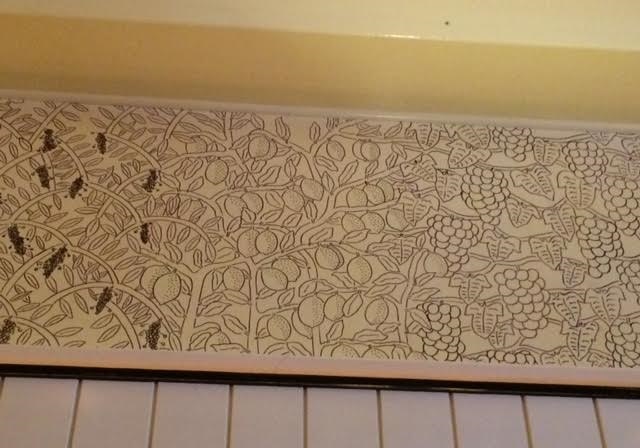 The decor includes drawings of California produce (grapes, figs, lemons, artichokes) on the walls near the ceiling and a lot of green, which Smillie said reminds him of Etiwanda besides being his favorite color. It seems like there’s probably always one or more dishes with lemon, and June’s menu boasted the Upland Cheeseburger (“grass fed beef, american cheese, peppadew peppers + avocado”), of which Smillie told me: “I wanted to riff on the Double Double.” At $20, it might be double — double! — the cost of the most expensive burger in our Upland, but that says more about us than it does about the restaurant. If you go, you might get to meet Smillie (pictured at bottom). And you can always ask for server Julia Tetrow, mentioned in my column as being from Redlands. 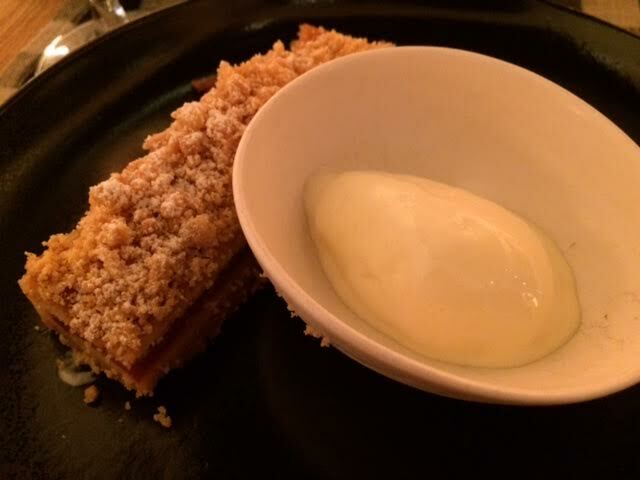 This entry was posted in Restaurants: Upland and tagged restaurants, Upland by David Allen. Bookmark the permalink. Did you throw in the seventh picture down to scare us? I had to look hard to be sure it wasn’t those things you said you never saw. Up near the ceiling? Perish the thought. You can click on it for a larger view — but maybe you’d prefer not to.